What is CAE and ADHD? CAE is a syndrome that occurs in 1 in 1000 children and is one of the most common types of early childhood seizures. The child presents around the ages of 5-9 years with frequent bouts of inattention and staring episodes, which can be described as ‘blanking out’ or daydreaming. The bouts last between 3-30 seconds and the child has no post-ictal state, they have no recollection of the episode and typically resume normal activity straight away. Other clinical features include automatisms which may take the form of eyes fluttering, chewing movements of the mouth or rolling eyes upwards. 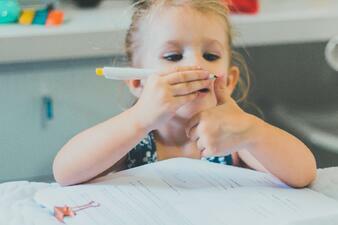 A child typically has numerous episodes a day which interferes with their ability to learn and process information. As the episodes are not dramatic, they tend to pass unnoticed by parents and caregivers for a long time before a diagnosis is sought. ADHD shares the core symptoms of inattention, staring episodes or daydreaming. Other symptoms include easy distractibility, disorganization, forgetfulness and a tendency to lose things. Impulsive (hyperactivity) symptoms include fidgeting, excessive talking, noisy behaviour and interrupting others. Hyperactivity symptoms may remit as the child matures but the inattentive and staring symptoms often persist. Symptoms tend to be present for at least six months before a diagnosis is made. Both CAE and ADHD could coexist in the same patient. If this is the case or the patient is misdiagnosed with CAE instead of ADHD and commenced on antiepileptic medications for CAE, then these medications may contribute to attention difficulties, irritability and hyperactivity because of the medications commenced inappropriately. What happened after the episode, how did it resolve and what was the child’s behaviour like. This will give you a clear indication of patterns in the behaviour and exactly how many episodes are occurring a day. An ADHD diagnosis is dependent on family and school assessments, behavioural history and clinical observation. A CAE diagnosis is made on similar reporting and an EEG may assist the diagnosis, but this EEG could also be unremarkable, so a detailed history and examination are the most important tool in differentiating between the conditions. CAE can sometimes be diagnosed in an outpatient clinic by inducing an absence seizure by the means of hyperventilation. Another key feature which would help your diagnosis is to ask whether the child can be roused out of the staring and daydreaming episodes when they occur. In CAE if you try and communicate with the child or tickle them there will be no response until the episode ends naturally, whereas in ADHD the child will generally respond and refocus on you. 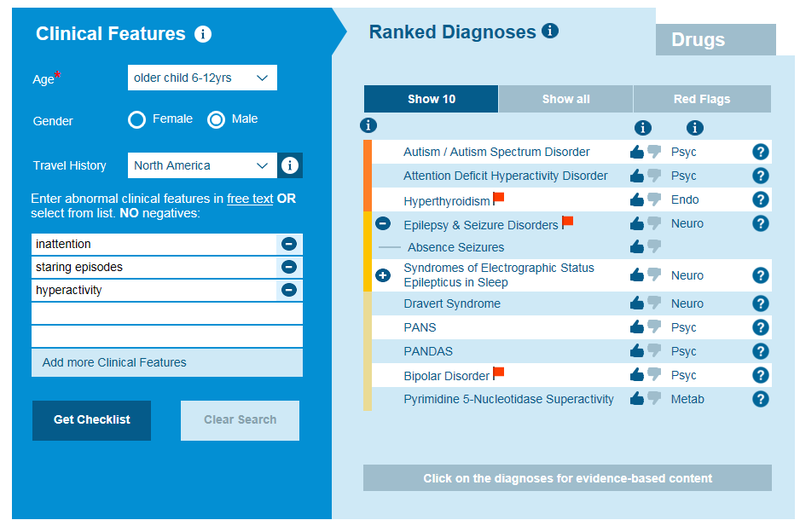 Using a differential diagnosis tool will help you organise the symptoms you have gathered from your history and see which symptoms are more likely to be represented by the conditions you are researching. ADHD appears a closer match than CAE for these symptoms using the Isabel DDx Generator with Likelihood Indicator, as hyperactivity isn’t a feature of CAE, but it is of ADHD. If you commence a patient on a medication for their ADHD or CAE and you get an inadequate response to that medication, then you should re-examine your diagnosis, especially if the patient develops new symptoms not seen previously. Ask the caregivers to maintain a behavior chart after medication has been started and if your diagnosis and medication is correct then you will see a reduction in episodes and an improvement in the symptoms described. Differentiating between ADHD and CAE is extremely important, as the misdiagnosis delays appropriate treatment and resolution of symptoms. In children, an early correct diagnosis and timely management can improve social interaction, behaviour and prevent poor academic performance. Once the correct diagnosis has been made regular evaluations and follow are essential to ensure the child’s condition improves and their medication is correctly adjusted as they grow. Increased clinical awareness will help resolve the diagnostic conundrum which exists between ADHD and CAE.